When I took my first pharmacist job in a hospital pharmacy, I didn’t know what ICHP was. Thank goodness for my assistant director and director of pharmacy! Both were active members of ICHP and the assistant director at Swedish American was the first to encourage me to join ICHP and start going to Rock Valley Society meetings. That was back in 1977! My Director was also encouraging and both of them made it a point to introduce me to many of the other members from surrounding hospitals in the Rockford area when I first started to attend. I think that’s why I’m where I am today. The point is, I joined because they asked and encouraged me to do so and then they made it a friendly place to go to. Once I began attending regularly, I built a network of friends, colleagues, and, several times, future co-workers. It didn’t take me long to do the same, inviting my new co-workers to join ICHP and making sure they got introduced to our colleagues all around the Rockford area. And believe me, for a time in 1980 and 1981, I had new co-workers almost every month. But that’s a story for another Directly Speaking column. And you know, the same thing happened when I attended my first ICHP Annual Meeting. A couple of my colleagues and I were delegates to the ICHP House of Delegates in 1983 or 84 and while it was my first ICHP annual meeting it wasn’t for the others. They knew many of the ICHP leaders and they made sure I was introduced to most of them. I remember sitting at the closing awards banquet and thinking that someday I would like to know the people sitting at the head table! Now I play a significant role in deciding who those people are! It is truly amazing how friendly the members of ICHP can be and while I have heard stories of how “clicky” ICHP can be, I know that there have been very few ICHP members who wouldn’t or won’t talk to anybody if they just walk up and introduce themselves. And it is even easier to get a conversation going when a colleague introduces the newbie personally! You see, one of the many things I’ve learned about pharmacists while working for ICHP is that almost all of them are very friendly but even more of them are shy! I’m not sure why that is but maybe it is easier talking to a patient about their meds, something we know a lot more about than them, than meeting a new friend? I think we’ve lost a little bit of the fun locally because many of the affiliate meetings have disappeared. The pharmaceutical companies can no longer bribe us with the fancy meals and hired gun speakers like they used to do and several of the affiliates struggle to get volunteers to serve as officers to coordinate a scaled down dinner meeting. I think that’s unfortunate for many who would feel comfortable sticking their toe in the water in a setting close to home. But a few of the affiliates are still successfully meeting in the evenings, learning about cutting edge practice, building networks and exchanging ideas. And it happens on a grand scale at both of ICHP’s statewide meetings in the spring and fall! Speaking of which, this year’s Spring Meeting registration is open! Hint, hint! If you’re an ICHP member, and I’m guessing most of you reading this are, think back to when you first joined ICHP. Did someone invite you to join or attend a meeting? What was your first experience with ICHP like? This year’s Spring Meeting is centrally located in East Peoria on April 13-14th and offers great education, outstanding networking opportunities, a cutting edge exhibit program, the latest research from two poster sessions and a ICHP Pharmacy Action Fund “Fund Fair” on Friday night that will remind you of your elementary school Fun Fairs only with more fun, great food and adult beverages! This Spring Meeting will be a great place to bring a friend or two, introduce them to some of your friends from around Illinois and show them that ICHP is a fun place to be. The 2017 Midyear Clinical Meeting has come and gone, but the experience, connections, and fresh ideas carries us into the New Year. The Midyear meeting is a great time to catch up with old friends and colleagues, establish new connections, and gain fresh perspectives and ideas to bring back to our practices. This year’s programming included a spotlight on the ASHP Foundation’s 2018 Pharmacy Forecast. I had the opportunity to attend two sessions on the Pharmacy Forecast. The first was a presentation by contributors of the Pharmacy Forecast that highlighted major trends and sections of the Forecast. The second session was a networking session on how ASHP affiliate organizations could use the Pharmacy Forecast for strategic planning. Both sessions provided great insights from both a state affiliate organization and individual practice perspective. The ASHP Foundation Pharmacy Forecast is a free report published by the ASHP Foundation that appeared in the January 15, 2018 issue of the American Journal of Health-System Pharmacy (AJHP). The Pharmacy Forecast is a report that highlights emerging trends in health system pharmacy practice and serves to support and improve strategic planning effectiveness. The report analyzes predicted trends and contains practice recommendations in key areas of pharmacy practice. The areas include therapeutic innovation, data, analytics, and technology, business of pharmacy, pharmacy and health-system leadership, advanced pharmacy technician roles, population health management, public health imperatives, and coping with uncertainty and chaos. The report assists health-system and state affiliate leaders to look beyond immediate operational challenges and trends outside of pharmacy’s immediate purview to plan for key issues that impact the profession of pharmacy. Today, there is a fair amount of uncertainty and chaos in health care. Programs such as the Affordable Care Act and the 340 B program are under question with the current administration and could have significant impacts on health-system revenues. The number of drug shortages and recalls has risen to levels that are equal or worse than those experienced several years ago. Pharmacy revenues are also being pressured by egregious drug price increases, DIR (direct and indirect remuneration) fees, and PBM (pharmacy benefit manager) lockouts. With these forces in mind, the forecast recommendation is to be prepared for significant reductions in revenue through good stewardship of organizational resources and focus on core business operations like sterile compounding, automation, and inventory management to reduce waste. Also, recognize and seize opportunities to advance services and create new business lines. Key trends that that have implications for state affiliates include the opioid crisis, telehealth, and uniform technician regulations. The report identified that 75% of health-systems have a major campaign focused on the prescribing of opioids. In Illinois, legislation has passed to increase prescriber and pharmacist use of the prescription monitoring program to aid in identifying individuals who are at risk for controlled substance abuse. Pharmacy benefit managers (PBMs) are putting mandatory reviews and authorizations in place around opioid selection and quantities prescribed. Health-systems are also playing a role at the local level to implement safer prescribing practices. Telehealth is another key area that has implications for state affiliates. In at least 25% of health systems, most chronic care patients will receive some of their ongoing health through telehealth applications. Areas of potential impact include the pharmacy practice act, board of pharmacy rules, reimbursement for care, and provider support. We are fortunate in Illinois to have generous telehealth regulations and health-systems are able to adopt telehealth technologies with minimal barriers. National uniformity of regulations regarding technician training and duties also has implications at the state affiliate level. The Forecast identified that the trend will be for state boards of pharmacy to move towards a more uniform standard for technician training. ICHP, with support from its Government Affairs Division, plays a key role in providing input on regulations impacting technician training and duties. As we consider these trends, and their implications as a state affiliate, we can use the following framework to guide our efforts to support our members. Start with asking what are the key underlying issues from a state society strategic planning perspective. Next rank the impact (high, medium, low) on strategic implications for ICHP and the opportunity for ICHP to have an impact. Finally identify the potential actions in the areas of education, policy advocacy, public communication, and partnerships with other professional organizations. I encourage you to review the 2018 Pharmacy Forecast and reflect on trends that impact your practice site and have implications for ICHP. Consider how you can use the report to elevate your teams and the profession. I look forward to working with members and the division leaders to incorporate key trends into future planning and initiatives. What is your current leadership position in ICHP? What benefits do you see in being active in a professional association such as ICHP? Get to work with pharmacists, who I don’t know, and I learn a lot from them. They have a wealth of practice experience and opinions on pharmacy. Their ideas often have application to my own work. When you graduate from pharmacy school, everyone tells you to go out there and make a difference. I feel like I am making a difference in the profession of pharmacy with the work I am doing at ICHP. What initially motivated you to get involved in ICHP? Originally, it was essential for the Chicago College of Pharmacy. All our students need institutional IPPE and APPE rotations and approximately 25% of our graduates take positions in institutional pharmacy. So, it was important for CCP to have good working relationships with existing and prospective partners. However, now, after working with ICHP for several years, many of the members are professional colleagues and friends. The partnership has experienced a great evolution over time. Where did you go to pharmacy school? Where have you trained or worked? 1976-1977: Hospital pharmacy residency, Thomas Jefferson University Hospital, Philadelphia. What special accomplishments have you achieved? As a faculty person: I was the first tenured female Pharmacy Practice member at the University of Illinois at Chicago College of Pharmacy. As an administrator: I was appointed Associate Dean of Academic Affairs and Dean of the Chicago College of Pharmacy when I was in 44 years old….at that time, that was young for a Dean. For scholarly activity: I have served as co-editor of the Pharmacotherapy Self Assessment Program (with John Murphy) for the last 2 editions, and will continue for the next edition. Approximately 5000 BCPS-certified pharmacists subscribe to this program and use it as a method for recertification. I have also edited Basic Skills in Interpreting Laboratory Data for the last 3 editions. This is one of ASHP’s most popular textbooks and the content is unique as a textbook for pharmacy education. Each edition has gotten better and better thanks to all my authors and reviewers. I started out in drug information and was the Director of the Drug Information Center at the University of Illinois Hospital, 1979-1982. The skills of literature retrieval, analysis, and application have been invaluable in all of my work through the years. I also developed expertise in men’s health, as I was the clinical pharmacist on a urological surgery service at UIH and the Jesse Brown Veterans Administration Hospital from 1980-1994. I currently am serving as Vice President and Chief Academic Officer of Pharmacy and Optometry Education at Midwestern University. I supervise four colleges, 2 in pharmacy and 2 in optometry. My responsibilities include mentoring/training deans; overseeing cost-effective use of facilities, financial, and personnel resources; and making sure that my colleges’ academic degree and residency programs achieve/maintain accreditation for the maximum cycle length. While doing administrative work, I am trying to break the mold of typical university administrators in that I try to keep productive in scholarly activity. This is definitely a challenge, but I think it is important. Daniel Hussar, Ph.D., for his longevity in academic pharmacy and his altruism. He was my dean when I was at PCP&S. My father, who placed a high value on educating his children. This impacted my pharmacy career path. My brother, who was committed to helping others. His values shaped my thinking on many aspects of my life. What advice would you give to student pharmacists? When a new opportunity presents itself, don’t think about it as extra work. Think about it as an opportunity to develop a new skill, work with people that you don’t know, an opportunity to accomplish something that leads to doors opening for you. Excellent time management skills are very important. They allow you to multi-task and get many things done at the same time. Teamwork skills are essential to your future work. Tasks are more enjoyable and successful when everyone on the team is rowing the boat in the same direction. Don’t burn bridges too early in your career. Pharmacy is a really small world and you will bump into the people you are trying to avoid again and again during your career. 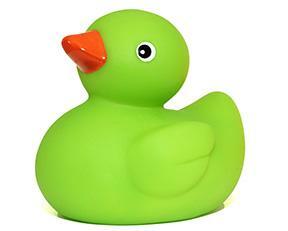 What pharmacy related issues keep you up at night? I am very optimistic about pharmacy and the resilience of the profession. So, nothing keeps me up at night. Do you have any special interests or hobbies outside of work? There is no place like home. Staycations are good. I travel a lot in my work during the week, so I enjoy being at home when possible. My parents were immigrants to the U.S. after WWII and they ran a Chinese hand laundry. They wanted their 5 children to have a better life, so they really pushed all of us to do well in school so that we could go to college on scholarships. What 3 adjectives would people use to best describe you? The January 9th Board of Pharmacy Meeting was held at the James R. Thompson Center at Randolph Street and LaSalle Street in downtown Chicago. These are the highlights of that meeting. New Board Member Introduced – Board Chair, Yash Patel introduced Glen Pietrandoni as a new pharmacist member of the Board of Pharmacy. Glen will replace Phil Burgess who served nearly 15 years on the Board. Mr. Patel thanked Mr. Burgess for his many years of service to the State and its citizens. NABP Annual Meeting – The National Association of Boards of Pharmacy will conduct its Annual Meeting in Denver on May 5-8. Yash Patel will serve as the Illinois Delegate to the meeting with Ned Milenkovich as first alternate and Denise Scarpelli as second alternate. Department Update – Katy Straub, Board of Pharmacy’s general counsel provided news from the Department of Financial and Professional Affairs. The first meeting of the Collaborative Pharmaceutical Task Force will occur later in the day (January 9th) at the Thompson Center. The Task Force has been charged to discuss and identify recommendations on 16 items identified by the General Assembly related to the practice of pharmacy. Many of the issues stem from bills introduced in last year’s General Assembly related to workload issues and e-prescribing. The draft compounding rules were formally published in the Illinois Register on December 26, 2017. The public, including the pharmacy public, has 45 days to provide comments back to the Department. The comment period ends on February 8th. This draft also contains some clean-up language related to the stocking of automated dispensing and storage systems. Dr. Aarti Parikh, pharmacy investigator for the Department has recently completed NABP’s sterile product investigator certification. Additional pharmacy investigators are scheduled to complete this certification in 2018. Robert Nelson has been hired by the Department as an investigator and will cover the territory previously covered by former investigator Nancy Hall. He will be based out of Springfield and will cover the southern half of the State. Pharmacists and pharmacy technicians may cover their home address on their publicly displayed licenses with a small piece of paper. Registrants may not black out the home address with a marker as this is considered defacing their license. Also, now that registrants may print a new license on demand from the IDFPR website, every work site should display a printed license and not a photo copy. License Renewal – Pharmacist, pharmacy technicians, student pharmacist and pharmacy licenses are up for renewal by March 31, 2018. Pharmacists must have their continuing education credits completed and licenses renewed on or prior to March 31st. It normally takes 2-3 business days for the renewal to show up online. You should be able to print your license once it has been renewed and may reprint as many copies as you need for each worksite. Legislative Update – Garth Reynold, IPhA Executive Director provided this month’s update. The Spring Session of the General Assembly has yet to begin and SB772 was discussed with the Board during the last meeting. Garth briefly discussed HB0313 which revised the Nursing Practice Act and created a new level of Advanced Practice Registered Nurse with full practice authority. This new level of Advanced Practice Nurse has a much less stringent collaborative practice agreement but must be registered with the Department after completing at least 4000 hours of clinical experience and 250 hours of continuing education and attaining national certification. The rules are not even in draft form, so this level of Advance Practice Nurse will not exist for several months or more. Next Meeting – The next meeting of the Board is set for March 13th to begin at 11:00 am in the Department of Financial and Professional Regulation Building at 320 W. Washington Street in Springfield. These meetings are open to the public and pharmacists, pharmacy technicians and pharmacy students are encouraged to attend. In November, the American College of Cardiology (ACC) and American Heart Association (AHA) released the new clinical practice guideline on the management of hypertension at the AHA 2017 Scientific Sessions.1 The guidance document, published simultaneously in the Journal of the American College of Cardiology and Hypertension, was a long-awaited update to the Seventh Report of the Joint National Committee on Prevention, Detection, Evaluation and Treatment of High Blood Pressure (JNC-7), which was issued in 2003 by the National Heart, Lung and Blood Institute (NHLBI).2 The Eighth Joint National Committee (JNC-8) and several other individual organizations have published less comprehensive guidelines and expert consensus statements since the publication of the JNC-7. However, none were as extensive or widely endorsed in clinical practice.3 The JNC-8, American Society of Hypertension and the International Society of Hypertension (ASH/ISH), the International Society of Nephrology Kidney Disease, Improving Global Outcomes (KDIGO) guidelines, as well as the consensus statement from AHA/ACC/ASH for patients with comorbid coronary artery disease vary in their blood pressure (BP) thresholds for pharmacotherapy initiation, first-line therapy recommendations and BP goals (Table 1).4-7 The 2017 ACC/AHA hypertension guidelines aimed to provide clear and concise recommendations for BP management to alleviate the controversy that was generated by often conflicting previous guidelines and consensus statements. The ACC and AHA were given the stewardship by the NHLBI Advisory Council to develop a comprehensive, yet succinct resource for clinicians and public health practices.1 The new 2017 guidelines are a collaborative effort by ACC, AHA and nine other professional organizations: American Academy of Physician Assistants, American College of Preventive Medicine, American Geriatrics Society, American Pharmacists Association, American Society of Hypertension, American Society of Preventive Cardiology, Association of Black Cardiologists, National Medical Association and Preventive Cardiovascular Nurses Association. The new 2017 ACC/AHA guidelines lower the BP threshold that defines hypertension and recommend a more stringent universal BP target of <130/80 mmHg.1 The change in BP goal is based largely on the results from the SPRINT trial, which demonstrated a decrease in cardiovascular events in patients treated to a systolic blood pressure (SBP) of less than 120 mmHg compared to routine management with a SBP goal of less than 140 mmHg.8 The new treatment goals are expected to increase the U.S. prevalence of hypertension from 32 to 46%.1 Additionally, upon initiation of pharmacotherapy, authors recommend that patients should be reassessed and medications titrated monthly until BP goals are achieved (COR I, LOE B-R). These recommendations may be challenging for primary care physicians to implement on their own. Therefore, the guidelines endorse a team-based care approach (COR I, LOE A), which carves out a role for pharmacists practicing with collaborative agreements to assist with the increased number of patients who may require BP management and provides the profession another avenue to demonstrate value through improved patient outcomes. Understanding the major recommendations of the ACC/AHA 2017 hypertension guidelines and the evidence that shaped them will aid pharmacists in being successful in the implementation of these recommendations and ultimately, lead to improvement in patient outcomes. The reclassification of BP is expected to result in an increase in the prevalence of patients diagnosed with hypertension. However, this may not translate to an equivalent increase in the number of patients being prescribed pharmacotherapy for hypertension.1 This is primarily due to the incorporation of the 10-year atherosclerotic cardiovascular disease (ASCVD) risk assessment into the decision to initiate treatment (Figure 1). Patients without established cardiovascular disease (CVD) should have their 10-year ASCVD risk calculated before deciding to start antihypertensive pharmacotherapy. Patients with a 10-year risk <10% can elect to utilize lifestyle modifications alone if they are in stage 1 hypertension; however, these lower-risk patients are indicated for treatment with BP-lowering medications in stage 2 hypertension for primary prevention of CVD (COR I, LOE C-LD). Patients with clinical ASCVD and those without clinical ASCVD with a 10-year risk ≥10% should be initiated on BP-lowering therapy, in addition to lifestyle modifications, immediately if they are classified as having stage 1 hypertension or greater for secondary and primary prevention of CVD, respectively (COR I, LOE A). Adapted from Whelton et al. Hypertension. Regardless of the threshold for initiating pharmacological treatment, a BP target of <130/80 mmHg is now recommended for all adult patients with hypertension and clinical ASCVD or a 10-year ASCVD risk ≥10% (COR I, LOE B-R).1 Additionally, the guidelines state that it is reasonable to maintain this goal for patients without additional markers of increased CVD risk or with a 10-year ASCVD risk <10% (COR I, LOE B-NR). Historically, BP goals have been adjusted based on patient age and comorbidities, such as diabetes, cardiovascular disease and chronic kidney disease. 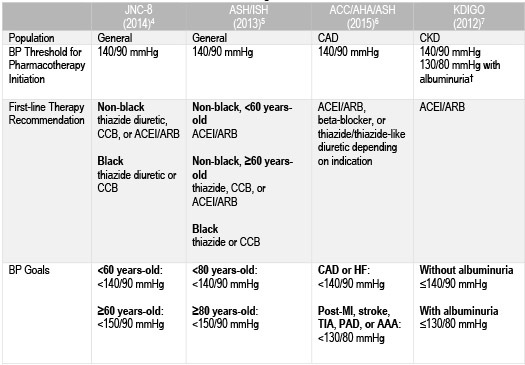 The new ACC/AHA recommendation to target <130/80 mmHg includes patients with those comorbidities and provides more specific guidance as to what to consider as first-line agents in the presence of such disease states. Of note, the American Diabetes Association (ADA) 2018 Standards of Medical Care released this past December continued to recommend a BP target of <140/90 mmHg for patients with diabetes, with the option of decreasing that goal to <130/80 mmHg in patients with high risk for CVD.10 The ADA chose not to adapt the more stringent BP target since patients with diabetes were specifically excluded from the SPRINT trial.8 Whether the ADA continues to recommend the more lenient BP target will depend on their interpretation of the meta-analyses of randomized controlled trials and observational data that helped shape the ACC/AHA recommendation for lower targets, even in patients with diabetes.1 This universal recommendation does not preclude the use of clinical judgement; it is still necessary to assess the risk-benefit profile when considering a BP goal of <130/80 mmHg in older adults. The use of out-of-office BP monitoring to confirm diagnosis of hypertension, guide titration of medications and rule out both white coat and masked hypertension is now preferred over in-office BP measurement (COR I, LOE A).1 This recommendation is based on the growing body of evidence that out-of-office BP measurement techniques, such as home BP monitoring and ambulatory BP monitoring, are better predictors of cardiovascular events compared to office-based BP measurement.11 The limitations of this recommendation are the cost of purchasing a home BP monitor to patients, the health-system costs of implementing ambulatory BP monitoring, as well as the concern for the lack of adequate training and improper use of these devices outside of the office setting. In the absence of out-of-office BP measurements, guidelines recommend that the diagnosis of hypertension and determination of BP control be made on the average of ≥2 readings from ≥2 different office visits (COR I, LOE C-EO). 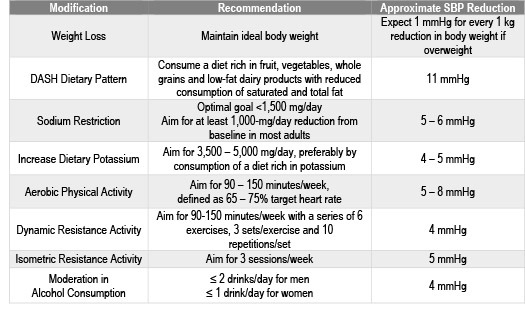 Non-pharmacologic therapy is indicated for all patients with elevated BP and confirmed hypertension.1 The BP-lowering that is anticipated as a result of these lifestyle modifications is now documented in the guideline (COR I, LOE A) and is a valuable tool for encouraging the implementation of these interventions (Table 3). It is important to note that these non-pharmacological interventions certainly do not have to be limited to patients with hypertension. Many patients with “normal” BP can also benefit from lifestyle modifications to prevent the onset of hypertension. First-line pharmacotherapy for non-black patients without a compelling indication continues to be calcium channel blockers (CCBs), thiazide diuretics, and either angiotensin-converting enzyme inhibitors (ACEIs) or angiotensin receptor blockers (ARBs) (COR I, LOE A).1 Thiazide diuretics or CCBs are considered first-line for black patients without a compelling indication (COR I, LOE B-R). These initial therapy options mirror the recommendation from JNC-8.1,4 The guidelines specifically state that chlorthalidone is preferred to hydrochlorothiazide on the basis of prolonged half-life and the CVD-reduction data from clinical trials.1 They also now explicitly recommend against the simultaneous use of ACEIs, ARBs and/or direct renin-inhibitors as a result of the ONTARGET and ALTITUDE trials, which demonstrated a lack of clinical benefit and increased adverse effects (e.g. 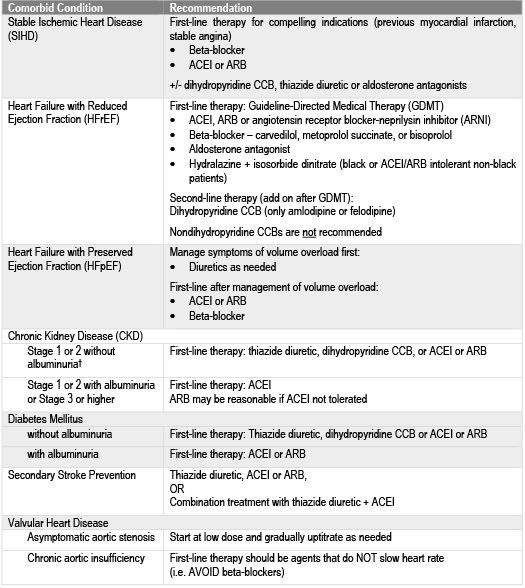 hyperkalemia, hypotension and renal impairment) with combinations of these agents (COR III:Harm, LOE A).1,12,13 Clinical considerations for BP-lowering drug classes and individual agents are included within the guidance document, along with initial treatment recommendations for patients with hypertension and specific comorbid conditions (Table 4). The guidelines have also reinforced the recommendation to initiate two BP-lowering agents from different classes in patients with stage 2 hypertension (COR I, LOE C-EO), which was originally recommended in the JNC-7 guidelines.1,2 This is based on the evidence supporting low-dose combination therapy in patients with a SBP >20 mmHg or DBP >10 mmHg above goal.1 Using a fixed-dose combination product titrated to a BP <130/80 mmHg to implement this recommendation is a reasonable approach while minimizing patients’ pill burden and costs of treatment. The 2017 ACC/AHA guidelines are the collaborative response to the almost 15-year gap in clinical practice guidance for the prevention, detection, evaluation and management of patients with hypertension. Since the publication of JNC-7, clinical trial and observational data has been accumulating without definitive recommendations from a comprehensive guideline on how to use the evidence in clinical practice. The reclassification of BP readings and endorsement of a lower universal BP goal reflects the aggregate of observational data demonstrating a graded increased risk in CV mortality with elevations in BP. This strong association, as well as the risk of other complications from uncontrolled hypertension, should be communicated to patients during collaborative discussions of when to start or adjust BP-lowering therapy. Pharmacists and other healthcare clinicians should be aware of these recommendations when treating patients with hypertension. In addition, the dissemination of recommendations in the form of education to patients and other healthcare providers will determine the impact of the ACC/AHA guideline on the burden of CVD and serve as a potential opportunity for pharmacists to demonstrate their value in new collaborative models of care. While pharmacists continue to expand their presence in the ambulatory care environment, they are in a unique position to counsel patients not only on their drug therapy, but on the impact of non-pharmacological, lifestyle modifications on hypertension. Whelton PK, Carey RM, Aronow WS, et al. 2017 ACC/ AHA /AAPA /ABC /ACPM /AGS /APhA /ASH /ASPC/NMA/PCNA guideline for the prevention, detection, evaluation, and management of high blood pressure in adults: a report of the American College of Cardiology/American Heart Association Task Force on Clinical Practice Guidelines [published online November 13, 2017]. Hypertension. Chobanian AV, Bakris GL, Black HR, et al. Seventh report of the Joint National Committee on prevention, detection, evaluation, and the treatment of high blood pressure. Hypertension. 2003;42:1206-52. Jeffrey S. Medscape: New ACC/AHA Hypertension Guidelines Make 130 the New 140.www.medscape.com/viewarticle/888560 (accessed 2017 Dec 10). James PA, Oparil S, Carter BL, et al. 2014 evidence-based guideline for the management of high blood pressure in adults. Report from the panel members appointed to the Eighth Joint National committee (JNC8). JAMA. 2014;311(5):507-20. Weber MA, Schiffrin EL, White WB, et al. Clinical practice guidelines for the management of hypertension in the community: a statement by the American Society of Hypertension and the International Society of Hypertension. J Hypertens. 2014;32(1):3-15. Rosendorff C, Lackland DT, Allison M, et al. Treatment of hypertension in patients with coronary artery disease: a scientific statement from the American Heart Association, American College of Cardiology, and American Society of Hypertension. Circulation. 2015;131:e435-70. KDIGO clinical practice guideline for the management of blood pressure in chronic kidney disease. Kidney Int Suppl, 2012; 2(5):337-414. SPRINT Research Group. A randomized trial of intensive versus standard blood-pressure control. N Engl J Med. 2015 Nov 26;373(22):2103-16. Lewington S, Clarke R, Qizilbash N, et al. Age-specific relevance of usual blood pressure to vascular mortality: a meta-analysis of individual data for one million adults in 61 prospective studies. Lancet. 2002;360:1903-13. American Diabetes Association. Standards of Medical Care in Diabetes – 2018. Diabetes Care. 2018;41(1):S1-S159. Reino-Gonzalez S, Pita-Fernández S, Seoane-Pillado T, et al. How in-office and ambulatory BP monitoring compare: A systematic review and meta-analysis. J Fam Pract. 2017;66(1):E5-E12. Mann JFE, Schmieder RE, McQueen M, et al. Renal outcomes with telmisartan, ramipril, or both, in people at high vascular risk (the ONTARGET study): a multicentre, randomised, double-blind, controlled trial. Lancet. 2008;372(9638):547-53. Parving HH, Brenner BM, McMurray JJ, et al. Cardiorenal end points in a trial of aliskiren for type 2 diabetes. N Engl J Med. 2012;367(23):2204-13. Consider to the extent to which Public Act 99-473 (enhancing continuing education requirements for pharmacy technicians) and Public Act 99-863 (enhancing reporting requirements to the Department of pharmacy employee terminations) may be relevant to the above issues. In addition, the Task Force may discuss and recommend other changes to the Pharmacy Practice Act and Rules as it agrees upon. The Task Force must provide recommendations by September 1, 2019 and proposed language for legislation (practice act changes) or regulation (rule changes) by November 1, 2019. However, the Task Force members in attendance at the January meeting tentatively agreed that they would have all discussions and recommendations completed by June 1, 2019 to give the General Assembly ample time to consider and hopefully pass any recommendations. The Task Force will continue to meet on the second Tuesday of each month at 1:30 p.m. in both Chicago and Springfield. Video links will be provided to facilitate discussions. Meeting notices will be posted on the IDFPR website and all meetings are open to the public. Audience participation will be limited. The Task Force has a challenging charge and only time will tell how effective this approach will be to improving the pharmacy practice act and rules. The work has begun and ICHP will be there every step of the way. "MALDI-TOF alone versus MALDI-TOF combined with real-time antimicrobial stewardship interventions on time to optimal therapy in patients with positive blood cultures"
"Osteopenia of Prematurity (aka Better Bones for Babies)"
"Impact of Pharmacist Involvement in the Transitional Care of High-Risk Patients through Medication Reconciliation, Medication Education, and Post-Discharge Callbacks"
The objective of the Best Practice Award program is to encourage the development of innovative or creative pharmacy practice programs or innovative approaches to existing pharmacy practice challenges in health systems within the state of Illinois. Applicants must be a member of ICHP for a minimum of 90 days prior to the submission deadline and practice in a health system setting. More than one program can be submitted by a health system for consideration. Each entry for the Best Practice Award must include a manuscript prepared as a Word document, double-spaced using Times New Roman 12-pitch type. A header with the paper title and page number should appear on each page. The manuscript should not exceed 2000 words in length (not counting references), plus no more than a total of 6 supplemental graphics (tables, graphs, pictures, etc.) that are relevant to the program. Each picture, graph, figure, and table should be mentioned in the text and prepared as a separate document clearly labeled. Submissions will only be accepted via online submission form. The manuscript will be forwarded to a pre-defined set of reviewers. Please do not include the names of the authors or affiliations in the manuscript to preserve anonymity. The program will be featured at the ICHP Annual Meeting. You will need to prepare a poster to present your program and/or give a verbal presentation. Guidelines will be sent to the winner. You will be asked to electronically submit your manuscript to the ICHP KeePosted for publishing. This program will be accredited for CPE and will require that you complete material for ACPE accreditation. You will receive a complimentary registration to the ICHP Annual Meeting, recognition at the meeting and a monetary award of $1,000 distributed to your institution. Non-winning submissions may also be considered for publication in the ICHP KeePosted, but your permission will be obtained beforehand. If you have any questions related to the program please contact Trish Wegner at trishw@ichpnet.org. Thank you to PharMEDium, Division of AmerisourceBergen for providing a grant for this year's Best Practice Award! The 2016 & 2017 Best Practice Winners Available for CPE! Click here to learn how ICHP members can obtain free CPE credit. 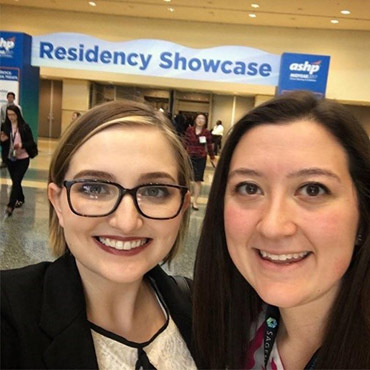 The American Society of Health-System Pharmacists (ASHP) Resident Matching Program (the “Match”) provides an orderly process to help applicants obtain positions in residency programs of their choice as well as help programs obtain applicants of their choice. For this year’s residency application cycle, rank lists are due to the National Matching Service website by March 6, 2018 and Phase I results will be released on March 20, 2018.1 With post-graduate training becoming more competitive each year, interviews are an integral part of ensuring that prospective residents are paired with appropriate programs and vice versa. In order to optimize the chances of finding the right fit, this article highlights important concepts on how to navigate an interview from the perspective of a candidate and residency program. Do your research. Review basic information about the program by looking at their website, brochures, and other relevant sources. This step will also help you formulate specific, open-ended questions to ask during your interview. Know your resume. Basically, you should “study” your CV because anything on it is fair game for questions! This includes reviewing rotation experiences, specific presentations, and job positions. Practice answering interview questions. Examples of interview questions can be found on the American College of Clinical Pharmacy (ACCP) and ASHP websites.2,3 Many programs will focus on behavioral interviews with situational questions. Tread cautiously as there is typically a “question behind the question” (i.e. the actual purpose of the question that you’re being asked). For example, if you are asked to describe a time you bumped heads with a peer, you are most likely being assessed on your communication skills, emotional intelligence, and conflict resolution approach. Take time to practice your responses, whether it is writing down talking points or running through mock interviews with peers or mentors. What (and what not) to wear. Look professional and be comfortable. This most likely includes a suit, closed toed shoes, and neutral colors. You never want to be remembered for wearing inappropriate attire. Communication is key. Speak clearly and use appropriate language. It is important to be aware of your non-verbal communication; make eye contact and have a firm handshake. Lunch will likely be with current residents and although this may seem casual, it is still a part of the formal interview process so continue to maintain professionalism with both residents and other applicants. Thank everyone. Hosting an interview is a time and labor intensive process that is worked into the normal workflow of pharmacy staff members’ schedules. Sincerely thank individuals at the end of each interview and follow up with written messages. Prepare your questions. Look internally to see what attributes and qualities you value most in your current residents and compile a list of required traits. Identify what you want to accomplish in your workplace and construct relevant questions around these criteria. Reduce Stress. Do you work well under extreme stress? The answer to this question is most likely no! Help your interviewees feel more comfortable by providing an itinerary, the names of people they will be meeting during the interview, and information they should be prepared to discuss throughout the day. Welcome others. Invite your colleagues to host different parts of the interview. This will help candidates to get an idea of the various different roles of a pharmacist at your institution. Additionally, this will provide multiple checks in assessing if a candidate is a good fit for the program. Assess potential. Think beyond the length of the program. Will this candidate be able to perform well as the world of pharmacy continues to evolve? Will they advance the profession of pharmacy? Cultural fit. In a nutshell, ask yourself if the candidate will be compatible with other employees including pharmacy members, nurses, and physicians. Think about if an individual’s goals align with the mission of the department as a whole. Sell the job. Keep in mind that interviews are a mutual screening process. Applicants are more than likely meeting with several programs and will have tough decisions to make before Match Day. If you are confident in a candidate, make sure you highlight the value they will get from choosing your program over others. Keep in mind that interviews are a mutual screening process and both parties should be exchanging thoughts and questions. As time goes on and you participate in more interviews, your answers and narratives may change, but stay true what is important to you. Ultimately, as stressful as interviews can be, take time to enjoy meeting new people and visiting different practice sites (after all, these could be your future colleagues)! American Society of Health-System Pharmacists Resident Matching Program, National Matching Services. Schedule of Dates. https://www.natmatch.com/ashprmp/aboutdates.html (accessed 2018 Jan 4). American College of Clinical Pharmacy. Interviewing Tips. http://www.accp.com/stunet/interviewing.aspx (accessed 2018 Jan 4). American Society of Health-System Pharmacists - Connect. Interview Questions with Follow Ups. http://connect.ashp.org/blogs/sara-white/2014/02/23/interview-questions-with-follow-ups?ssopc=1 (accessed 2018 Jan 4). ICHP 2018 Spring Meeting Registration Open! Sign up for the ICHP 2018 Spring Meeting, Elevate Your Practice and snag the early bird rate. Don't miss out on this limited time savings to attend the meeting and network with hundreds of pharmacy professionals, peruse exhibits for the latest in pharmacy, earn up to 10 hours of CPE and more! Register by March 16 to take advantage of this savings! Receive a discounted rate at the Embassy Suites East Peoria Hotel (100 Conference Center Drive, East Peoria, IL 61611) when you mention that you are attending ICHP's Spring Meeting! Call 309-694-0200 prior to March 17 to reserve your room. 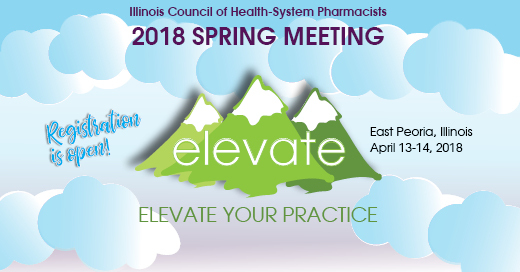 Take the lead in attending the Exhibit Program at the 2018 Spring Meeting! Exhibitors who provide products or services essential for health-system pharmacists, healthcare executives, pharmacy technicians, students and other related personnel will be there and they want to talk to you! Remember to show your support of our exhibitors at the meeting! Interested in sponsoring or exhibiting at the ICHP 2018 Spring Meeting? Contact Jan at JanM@ichpnet.org or visit our online exhibitor registration page. As eight years of academic and experiential preparation come to a close, I have had both time to reflect and a serious reality check about life beyond school. Most graduating students worry about managing student loan debt and, in this climate, finding a viable professional opportunity. I am not excluded from this. However, what is even more concerning to me now is advocacy. Let me begin by being completely honest with you, prior to my APPE rotation at ICHP I knew nothing about and was not naturally interested in advocacy. Pharmacy law, despite the passion of those who taught the course, was not as exciting to me as therapeutics or other classes I thought were more relevant to being a pharmacist. Legislative Day was something I did not prepare for when I went as a first-year pharmacy student, and remained an event I did not attend again because of competing priorities. Advocacy was not important because someone else would deal with it. After all, I needed to focus on studying anyhow. I was wrong. That takes a lot to admit. I made strategic decisions during school to better my personal and professional growth and, really, just survive at times. Legislation was not remotely a concern - but it should have been. Let me explain my new found knowledge to you. What is advocacy, anyway? Visions of reviewing bills came to mind. I was not entirely wrong but it is not as mind-numbing as it may sound. Some search results were self-explanatory, such as a summary proposing pricing transparency with PBMs. Yet others, such as the proposed use of cannabis in place of opioids in those with opiate abuse disorder, have been buried deep in an unrelated bill (in this case, a banking bill). More proposed legislation includes allowing nurses to have prescribing rights, omitting pharmacists entirely from the conversation. Those are just three small examples of areas for advocacy and for opportunities to create more jobs and value. Patient: A higher power/karma will take care of my diabetes, I don’t need to take insulin. Me: A higher power/karma will take care of pharmacy and my career, I don’t need to do anything. Patient: My doctor is responsible for managing my high cholesterol and once I take my statin I can eat whatever I want. Me: My national and state organizations/employer/health system is responsible for advocating for pharmacy and my career, once I join/am employed I don’t need to do anything. Patient: I don’t believe in cancer screenings, if it is meant to be it will happen no matter what I do so why worry about it? Me: I don’t believe in politics, if it’s meant to be it will happen no matter what I do so why worry about it? The problem with deferring responsibility to someone else is that your best interests are not being looked after. Employers are not looking to advance pharmacy practice or provide job security or a career trajectory for you, and often address legislation as it affects financial gain. State pharmacy organizations are key to scanning for threats and opportunities for professional action but require immense resources to make a difference. This includes individual pharmacists, pharmacy technicians, and pharmacy students taking the time to find out who their legislators are and introduce themselves. You can weigh in on proposals and, in turn, create a climate where pharmacists are able to prove value in managing patient outcomes and costs. I used to believe that advocacy was the responsibility of IPhA or ICHP, but as it became my responsibility as an APPE student, I realized it belonged to me all along. After all, who cares about me? My name is Sharon Karina, and I am a fourth-year pharmacy student. I was born in Germany to military parents and spent my years moving from North Dakota to Mississippi and almost everywhere in between. I originally worked in the telecommunications industry, but when I was able, I graduated with high honors with an Associates in Science from Triton College and was accepted into the Doctor of Pharmacy program at Midwestern University Chicago College of Pharmacy. My rotation with the Illinois Council of Health-System Pharmacists (ICHP) landed in our block 6, which means I am in the home stretch to graduation. 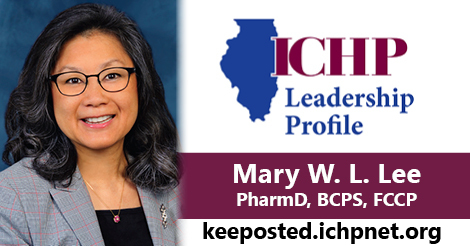 I choose this site as an elective because I have met many leaders within pharmacy who are involved with ICHP and I wanted to better understand their participation, motivation, and what was being done at the association level. I always let curiosity and “why” drive me and while I had no idea what this rotation would truly entail, I knew that it would help me further develop my skills and maybe even uncover new ones. At the time of this writing I have made it halfway through the rotation. During this time I have been able to participate in all aspects of association leadership and management, from the annual Board of Directors meeting to many conference calls and meetings that drive the success of ICHP. I have had the opportunity to edit CE programs for content, brainstorm efficient ways of monitoring proposed legislation, research and develop member engagement strategies, and many other equally important responsibilities. Because my rotation occurred close to Legislative Day, most of my duties centered around advocacy and government affairs, including a special opportunity to sit in on an Illinois Board of Pharmacy meeting as well as two Pharmaceutical Task Force meetings. I especially enjoyed listening to the approach of the Pharmaceutical Task Force as they discussed proposed legislation that would affect all pharmacists, pharmacy technicians, students, and every facet of practice. In my free time, I love to travel, learn, or hitch a ride on a sailboat on Lake Michigan in the summer. 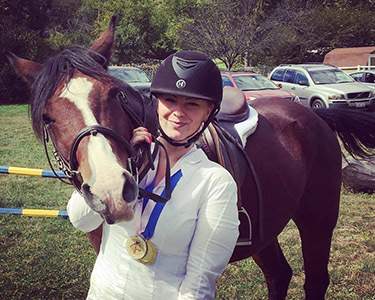 I am also an avid equestrian at heart, and enjoy jumping (poorly) and look forward to learning to play polo this spring at the Barrington Hills Polo Club. I love to give back to our community and currently volunteer on the Young Professionals Board at the American Heart Association and as a mentor to high-achieving city college students with One Million Degrees. I hope to continue to challenge myself to be a better pharmacist, mentor, and leader as my career develops. As I reflect on my internship with Albertsons this past summer, I realize the huge contribution that it made to my commitment to lifelong learning. During the 8-week program, all interns were assigned to work at a specific store. However, we were also involved in a host of other activities that made the internship a very robust experience! Teams of interns were involved in several projects. Since we were all required to present our findings, I felt as if these activities afforded me the chance to improve my public speaking skills. One project that we completed was developing a drug utilization review (DUR). This project introduced me to patient cases similar to those that may occur within the community setting. Our final project was to devise a business plan. Each intern was required to create a service that could be implemented at the Albertsons stores. The goal of my final project was to increase enrollment on the pharmacy application for smartphones to reduce wait times, transfer new prescriptions to our pharmacy, and ultimately serve our patients better. We collected data via use of a short survey provided at the “in” and “out” windows at my store. I discovered that the majority of patients who used my store were aged 50 years and older; many of them either did not own a smartphone or simply were not willing to enroll. The patients that were willing to take the survey were generally younger and expressed interest in using the program. Although we were not able to enroll many patients, I found it to be a great experience. To conclude, I would definitely recommend the Albertsons internship to my peers. The staff at my store were great and the individuals at the corporate offices were awesome! I was able to use the skills that I learned during my internship in the classroom. At the end of my internship, I was offered a part-time technician position. I plan to continue applying the knowledge I gained. I will acquire further skills as a new employee to become an advocate for the patients I will soon encounter as a pharmacist. If you are a P1 or P2 and considering a residency, you have probably asked the question, “Should I go to Midyear as a P3?” The answer is not quite as simple as you may think. When I began the journey to answer my burning question, I sought out advice from a few very wise colleagues. Now, opinions range far and wide on going to ASHP Midyear before P4 year. Most people provided some sort of gray area reasoning leaning either towards attending or not attending. As I thought through my decision, I weighed the pros and cons to determine the best choice for me. Here are a few questions to ask yourself when deciding whether or not to attend. I first asked myself, “What is holding you back?” The biggest obstacle for most classmates I have talked to is cost. It always costs money to attend national meetings, and this particular meeting is no exception. So now, the question is: “Is paying for the meeting worth it?” In my opinion, after attending the meeting, the cost was worthwhile. While at the meeting, I was able to practice skills needed to talk to residency programs as well as participate in networking at the conference. I learned at some clinical sessions, observed at some student sessions, networked at some receptions, and enjoyed Florida. Attending the meeting as a P3 with low stress and low stakes was a great decision. My 2017 meeting attendance was just a dress rehearsal for next year. I got the feel for the meeting, and I made some new connections along the way. Sure, a few programs were too busy to talk to P3s. However, I waited until the last hour of the showcases to be considerate of P4s and was able to talk to almost all of the programs to which I am tentatively interested in applying. Plan specific questions to ask each program for the residency showcase. Do not take up too much of any program’s time at the showcase. Be kind and professional to everyone, everywhere. Ask for a business card, offer a business card. Wear comfortable shoes. You will walk more than you anticipate walking. Go to receptions and network. Do not be shy. I hope to see everyone in Anaheim on December 2nd-6th, 2018! 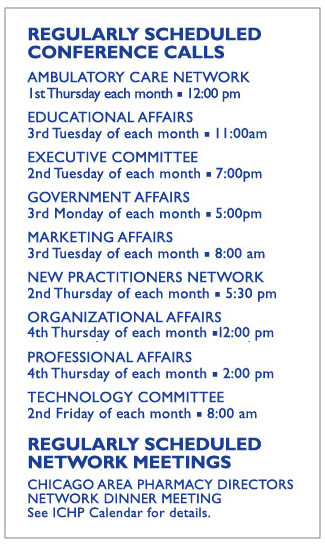 The Pharmacy Director Network meets bi-monthly and is open to ICHP member directors or their administrative designees. This program is not open to students, technicians or pharmacy staff. Accredited for pharmacists and pharmacy technicians | 1.0 contact hour (0.1 CEU). Updates to Heart Failure Guidelines: Are you ready to SHIFT into a new PARADIGM? Save the Date! Watch for more information in upcoming news briefs. NISHP Double Feature - Save the Date! Dinner and presentation sponsored by Allergan. Watch the CPE Newsbrief and follow us on Facebook for more information! Meeting space is limited. Student registrations will be limited to the first 10 students who register.